Leverkusen - Four games, four wins is the FC Schalke 04 balance so far in 2014 after Saturday's 2-1 success at Bayer 04 Leverkusen. The result leaves Jens Keller's Royal Blues just three points shy of their second-place Matchday 21 hosts and puts them right in the thick of the tussle for a top-three finish and the accompanying automatic berth into the group stages of next season's UEFA Champions League. Matchwinner Klaas-Jan Huntelaar met the press afterwards, touching on his own long-awaited comeback, the wealth of up-and-coming talent in Gelsenkirchen and how he's enjoying a slightly new role in the forward department. 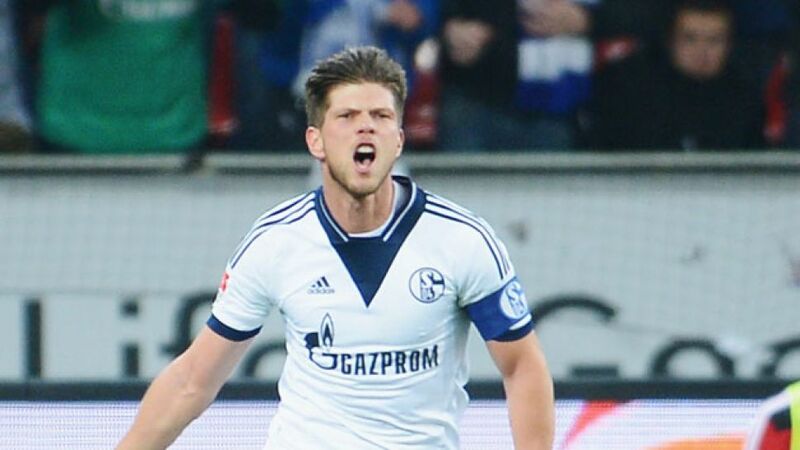 Question: Klaas-Jan Huntelaar, how do you explain Schalke's recent success? Klaas-Jan Huntelaar: We've scored at least a goal more than the other team every time. (laughs) That's how you win. Huntelaar: We dominated the first two-and-a-half games and played well. It was fine against Wolfsburg at the start as well. We had an extra man, but then we took our foot off the gas, became a bit complacent and they got back into the game. But we won in the end. In the other matches, we really were in control. We played a smart tactical game at Leverkusen and kept it very tight at the back. They had to keep knocking the ball around quite deep and had a lot of possession – that was our plan. We tried to shut up shop and force them into playing a long-ball game and it worked out well. Question: What was your own take on the matchwinning header you scored with your back to goal? Huntelaar: I knew I was fairly level with the near post. You have to try and make contact with the left side of your head and trust your instincts. Question: After being sidelined for quite a while, you're back in the thick of the action again. How's the mood within the team? Huntelaar: Everyone's satisfied and chilled-out when you're winning, that's always the way it is. We need to keep this up. The team have stuck together and grown closer in the process. That's a good thing. Question: Do you feel the standard of football has improved as well? Huntelaar: For sure. We brought in a top-drawer new player in Kevin-Prince Boateng while I was still injured. I'd never played alongside him before and he's doing a fine job in midfield alongside Max Meyer. And Leon Goretzka has just shown what he's capable of as well. He's an incredibly talented player. We have a lot of youngsters in the side, and Felipe Santana and Sead Kolasinac and the defence as a whole are really producing the goods. There's a lot of quality in the team. Question: How much are you enjoying being back in action, just in time for a stretch where one big game follows the next? Huntelaar: It's great, of course. After being out injured for a good while, you can't wait to get back onto the pitch. And you learn to really value what it means to be fit. Question: You seem to be playing a more flexible role up front now than that of the classic centre forward. Is that the case? Huntelaar: Yes, today I was playing more alongside Jefferson Farfan and less down the middle, with Max Meyer on the other side. We knew the defence would be holding the line rather than moving up in support. Max and myself operated more like playmakers and we always had someone available for a pass. After the break we played a bit more of a long-ball game on the break. I like the new role, it's slightly different and I get to see more of the ball. I think it gives us more of an attacking edge as well. Question: Did the performance against Leverkusen raise the bar for the team and will you be expecting to play like that all the time now? Huntelaar: We try to impose our own strategy on every game. As I said, we've managed that for two-and-a-half of the last three games. With the exception of the second half against Wolfsburg, we've dominated things and played aggressive attacking football. We took a different approach against Leverkusen, defending well and in numbers and looking to strike on the break. We carved out our chances and we took them. That was the difference between the sides. Question: Do you have second or third place in your sights now, or are you still looking over your shoulder at the team in fifth? Huntelaar: Finishing fourth is the minimum target. We've said all along that we want to make sure of fourth place before anything else, that's the priority. We can't afford to get carried away now, we just need to keep working as we have been. Then we'll see what comes out in the end. Next up, we've got Mainz, then come Real Madrid and FC Bayern. We're taking it a game at a time.